In the cutting wind I take the last steps to the top of the hill. Suddenly I sink to my waist into the snow. I can hardly move. Then I see the landscape in front of me. An endless snow field where a narrow river meanders in the valley. In the distance, mountains rise high in the sky. 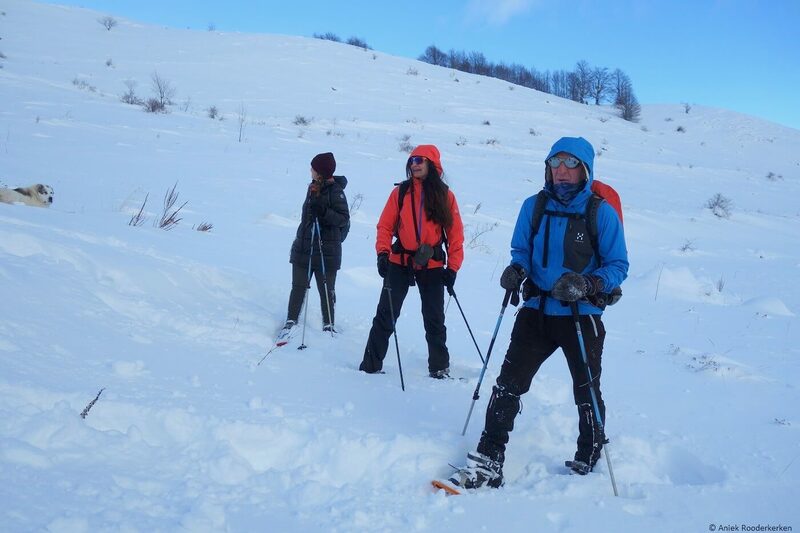 Snowshoeing in Bosnia and Herzegovina is a breathtaking adventure in a winter wonderland! A few hours earlier. With slipping tires we try to drive the van to our hut in Umoljani, a good hour drive from the capital Sarajevo. The road is slippery. Within moments we are stuck in the snow. 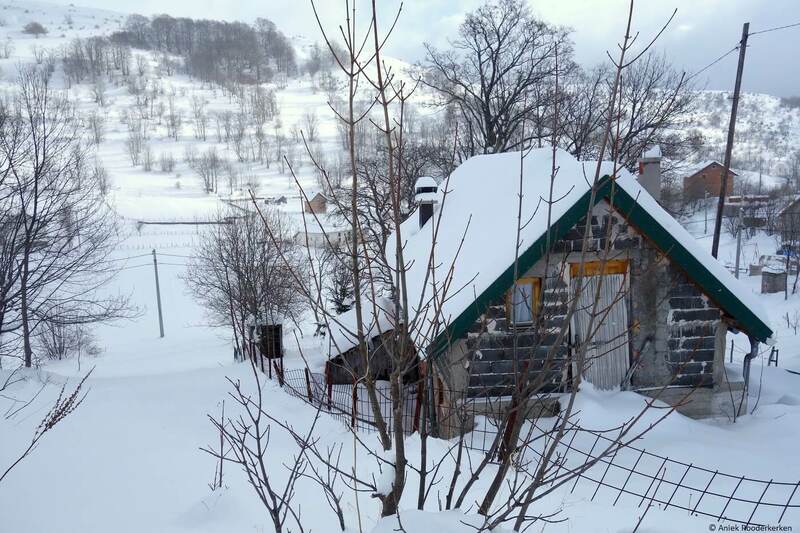 The last few days a lot of snow has fallen and the area is even more white than you would expect in Bosnia and Herzegovina in December. We planned to make a multi-day hike but this was canceled at the moment we saw the weather forecast. 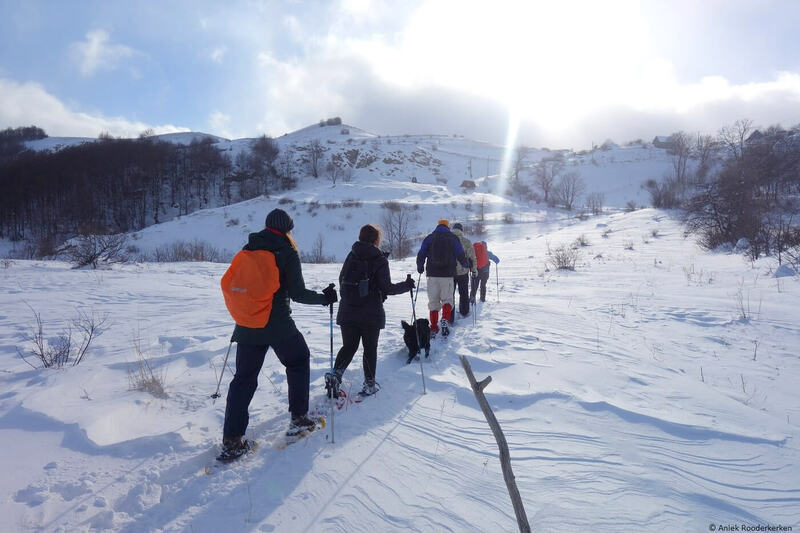 Instead we go snowshoeing, discover a number of cities and discover the Vjetrenica Cave. But first we have to get to our cabin. After shoveling the snow and thanks to Thierry who drives smoothly over the icy roads, we arrive at a mountain hut. 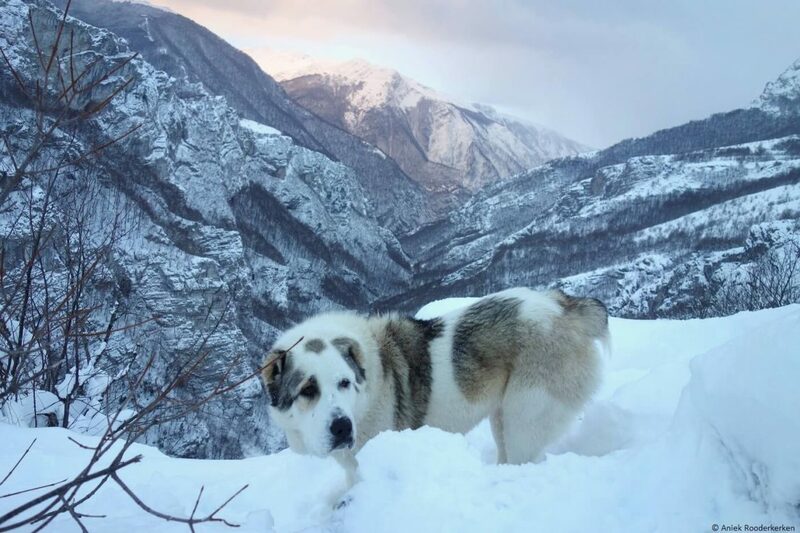 Immediately a big brown and white dog runs towards us through the snow, overjoyed with so many new people to meet. I quickly walk into the cabin, to warm up with a cup of Bosnian coffee. A little later I am outside again, thickly wrapped in all the thermo clothing that I have with me. I try to tie my snowshoes under my hiking shoes. I fasten the bindings and slide the hiking poles to the right size. Let’s go snowshoeing! The first meters cross over asphalt with a thin layer of snow. Earlier, on my hiking shoes I almost fell down at the first step on the ice. With my snowshoes fastened I hike smoothly over the snow. Then we leave the village and walk in a wintry landscape under a beautiful blue sky. The shimmering powder snow is cracking under our shoes. 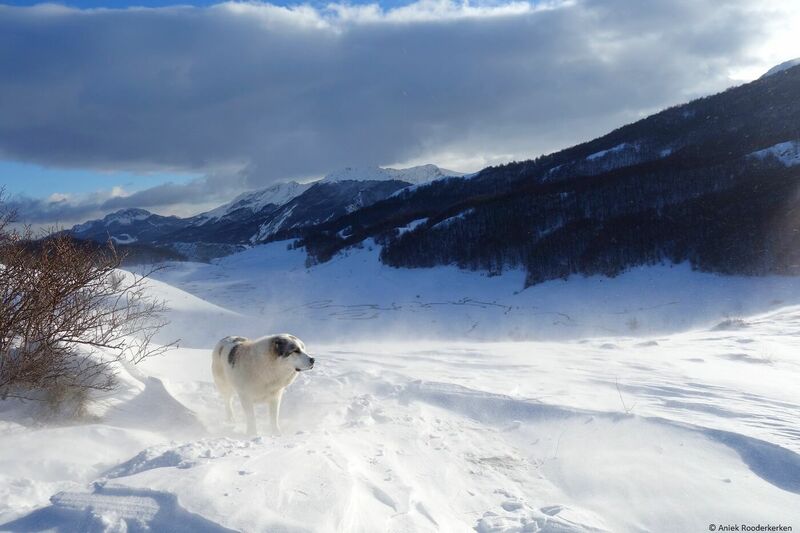 The two dogs from the mountain hut decide to walk with us and they are running around in the snow. A little further on, Lorenc gives us a red berry. Rosehip. The last berries that are still hanging on the branches are clearly visible in the snow with their bright red color. They have a sweet-sour taste. Today two guides accompany us, Lorenc and Thierry from GreenVisions. They know the area inside and out and have mapped out a route over the mountain ridge for us. But first we have to get used to the snowshoes. It is much easier than walking with normal hiking shoes through the snow, because you are less likely to sink into the snow. After a few hundred meters I am used to them and I am progressing faster and faster. I never walk with hiking poles, but here it is necessary to support yourself. We hike past a few simple huts resting on the flank of the mountain and a little later we stop for lunch. Lorenc and Thierry brought us sandwiches and fresh fruit. We sit down in the fresh snow and have lunch with a beautiful view over the valley and Umoljani in the distance. “And now in high heels up the mountain”, I suddenly hear. High heels? I look around me to see what the intention of this shout-out is. I see that the shoes have a brace under the heel that can be tilted. This way you can easily climb a steep slope. Meanwhile, the wind has started to blow and there is a fine dusting of snow all around us. 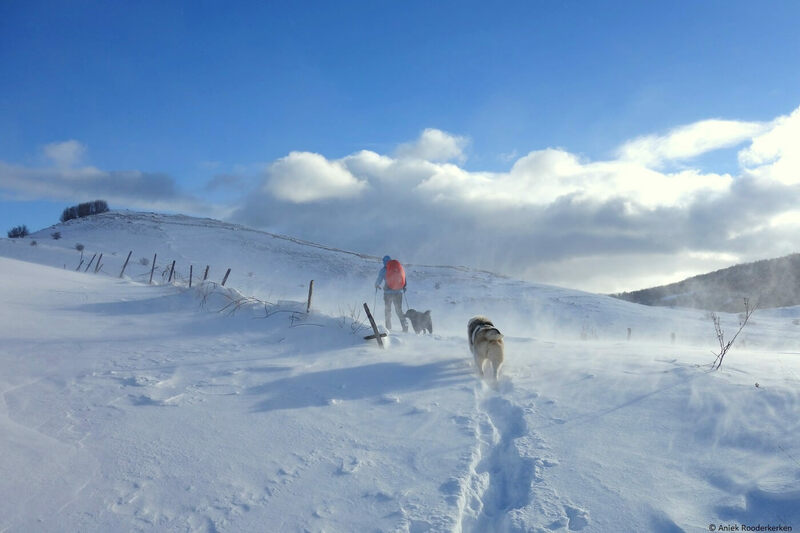 The dogs continue to walk, undisturbed by the icy wind. A little further we are at the highest point of the route. We have a distant view over the mountain Bjelašnica and the river that meanders through the snow. A few moments later I sink to my waist into the snow. Luckily, three steps further I am freed from the high snow and we continue to walk down the mountainside. Every time I think the view can’t get even more beautiful, I see something new again. It is beautiful! The pointed mountainpeaks tower high above the snow. A little lower on the flanks of the mountain we see the dense forests. Only one hour away from the capital of Bosnia and Herzegovina you are surrounded by raw and remote mountain ranges. We descend through the forest to the mountain hut. On a crystal clear stream there are about seven small water mills, which were used for centuries to grind wheat into flour. 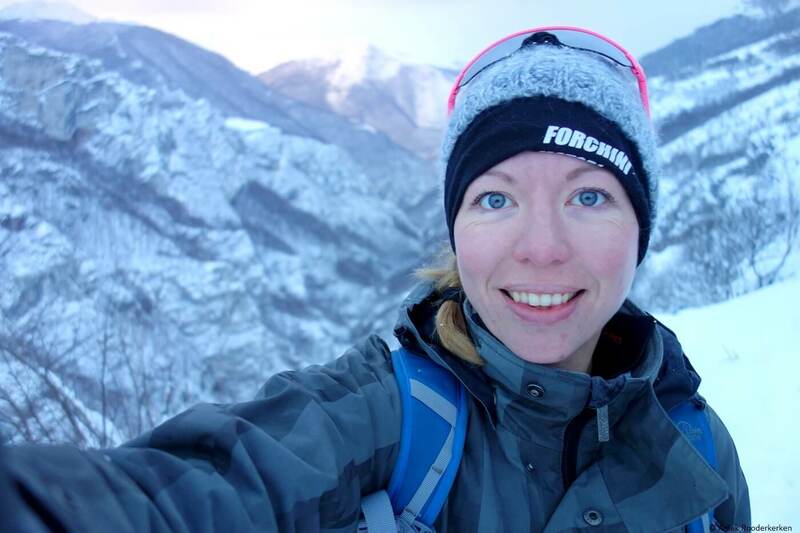 We pass them and walk the last few meters to Umoljani, where a hot shower and Bosnian coffee awaits us. And a well-deserved dinner. 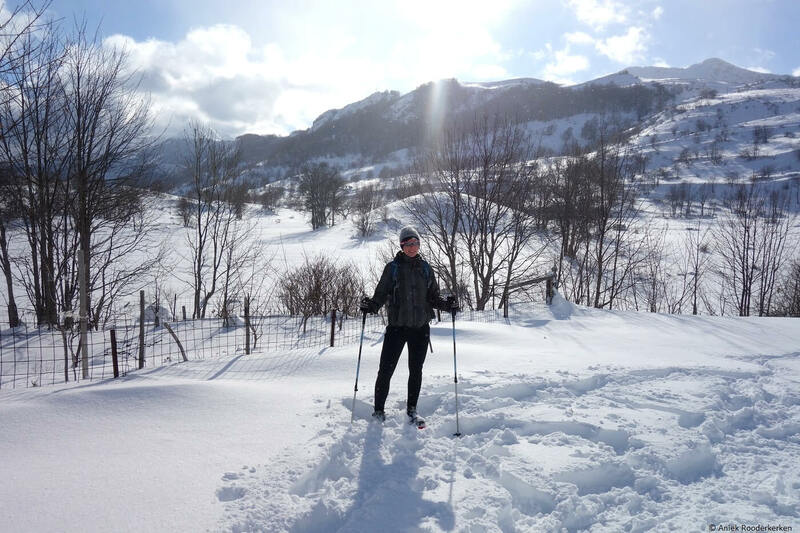 We agree on one thing: snowshoeing in Bosnia and Herzegovina is a breathtakingly beautiful adventure in a winter wonderland! I visited Bosnia and Herzegovina at the invitation of UNDP Regional Office Herzegovina to promote Via Dinarica. I made this trip with Green Visions. All tips and opinions that I share here are of course mine.